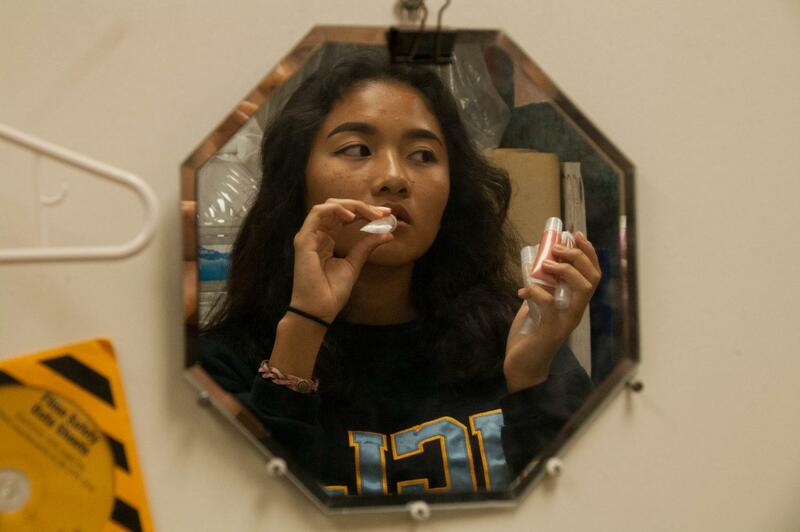 Sophomore Edelina Bagaporo sits at her kitchen table with supplies like a premade mixture of rose pigment, a hint of holographic glitter, and a strawberry fragrance laid out in front of her. She turns back to her cell phone to verify the lip gloss order placed by a customer through her Instagram business account, @intrntgrl.cosmetics, and starts finalizing the product. At the very start of Edelina Bagaporo’s business, she was motivated by the idea of making and selling products with a close friend, Danika Sanchez. Sanchez originally thought of selling clothes, though Edelina Bagaporo but decided to do something “easier” like lip gloss. The two originally intended on working together but due to the distance between them with Sanchez living far away, Edelina Bagaporo stuck to conducting the company herself. According to Edelina Bagaporo, research informed her that she did not have to get a license due to technicalities in state and local liscensure laws. “A lot of my [products were] based off of social media, so I thought that Intrnt Grl would be a fitting name. [Sanchez] helped me make it up. A lot of the marketing I do is all on social media and the internet,” Edelina Bagaporo said. The true beginning of the business came when Edelina Bagaporo launched in the very first week of BVH’s 2018-19 school year with minimal supplies, believing that they wouldn’t sell out quickly. She began to post order forms for customers to screenshot and customize their base color, scent, effect and glitter. “At first it was actually surprising cause I only bought a small amount of supplies and ended up selling out pretty quickly. My friends supported me so much so it was easy to get it going,” Edelina Bagaporo said. In order to assemble a lip gloss, she uses a pre-made mixture from TKB Trading, a cosmetic supply company that includes makeup, nail, bath and body, equipment and kits and arts and crafts products. She also buys packaging or tubes to put her mixtures in. Before advertising her products, she background checks all of the ingredients within the mixture to ensure that they are FDA approved, cruelty free, and vegan. “My main concern was what was going into my products. I didn’t want people to get sick or have reactions to them, so I made sure to check before I bought [the supplies]. ‘Is this approved by the FDA?’ I looked up some videos on it and I did some research to make sure I wasn’t getting problems like that,” Edelina Bagaporo said. After Edelina Bagaporo finishes a product, she delivers them to the customers who had ordered before or after school to “comply with the [school] rules,” of not selling or distributing during school hours. Her demographic of customers come from places like BVH, include old elementary school friends, and “friends of friends” from different schools. Freshman Lourdes “Lulu” Castruita is one of Edelina Bagaporo’s consistent customers. “I would describe the quality of the product to be very well because I like the consistency of the glosses and the way it makes my lips feel and look. The product doesn’t dry out when I use it,” Castruita said. So far, Edelina Bagaporo has sold a total of 112 lip glosses. She hopes to reach new customers by expanding her line of products to include items like chap stick.